Blog post on one state's experience with state payment policy for palliative care. 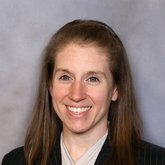 Over the past 11 years, Kate O’Malley, RN, MS has served as a Senior Program Officer at the California Health Care Foundation (CHCF). Throughout her tenure, she has spearheaded or overseen numerous projects to improve care for seriously ill Californians, including establishing and growing palliative care programs in California’s safety net hospitals; developing tools and resources to move palliative care out into the community; and facilitating payer-provider partnerships. Kate’s leadership at CHCF has been a key contributing factor to the expansion of high-quality palliative care across the state, and she is highly regarded as a thought leader and champion in efforts to improve care for vulnerable populations. In the week before her retirement, Kate was generous enough to speak with us about some of the lessons she took away from her time at CHCF. She also shared suggestions on initial activities for states interested in expanding access to palliative care and highlights from some of her favorite projects (preview: activities that brought the message and benefits of palliative care to underserved communities). The following interview has been condensed and edited for clarity. CAPC: How did CHCF come to select palliative care as one of its core topics? KOM: It actually took a little time before we landed on palliative care. As you already know, the target population for palliative care can be relatively broad – people living with serious illness, regardless of diagnosis, prognosis, age, etc. – and, early on, we wanted to focus on where we could most easily identify the defined population and need. Therefore, about a year into my tenure at CHCF, we chose ‘appropriate care towards the end of life’ as a strategic priority. The first challenge was developing an operational definition for what constituted ‘appropriate’ care in the context of serious illness. We ultimately came up with a two-pronged definition: appropriate care is evidence-based, and appropriate care is what the person wants. Obviously accomplishing the latter part is difficult – but if the patient doesn’t want the care, then it’s inappropriate regardless of what the evidence base says. So our next step was to identify a mechanism through which clinicians could systematically capture the preferences of seriously ill patients. We ended up focusing on the Physician Orders for Life Sustaining Treatment (POLST) model that originated in Oregon. This model was attractive to us because it provided an opportunity to go beyond do-not-resuscitate orders and actually discuss intensity of care. All our educational efforts focused on improving the quality of that conversation, with the POLST form as the tool to document it. CHCF’s first major project in this space became promoting awareness and adoption of POLST in California’s health care system. But, as we know, collecting patient preferences is insufficient for improving care if there is not a system in place to give effect to these preferences. Therefore, once we had identified an approach we felt captured what individuals’ want, the next step was identifying an evidence-based solution to help providers deliver this care. Palliative care was a pretty clear answer, and it had the benefit of not just being limited to downstream care. We started working on strategies to expand access to palliative care projects fairly early on, with a focus on California’s public hospital system of 17 acute care hospitals. CAPC: What have been your favorite projects at CHCF? KOM: I am grateful for all the work we were able to accomplish, so it is hard to pick among them. However, two projects stand out because of the amount of “hands on” work involved – the Interpreter Project, and the “Being Mortal” screenings. The Interpreter Project. As CHCF concentrates much of its efforts in safety net hospitals (in which approximately 40 percent of individuals and families served are either monolingual or have limited English proficiency), we have come to appreciate the role of interpreters. Our palliative care teams saw thousands of patients over a five-year period, and often had to call interpreters to the bedside to help. 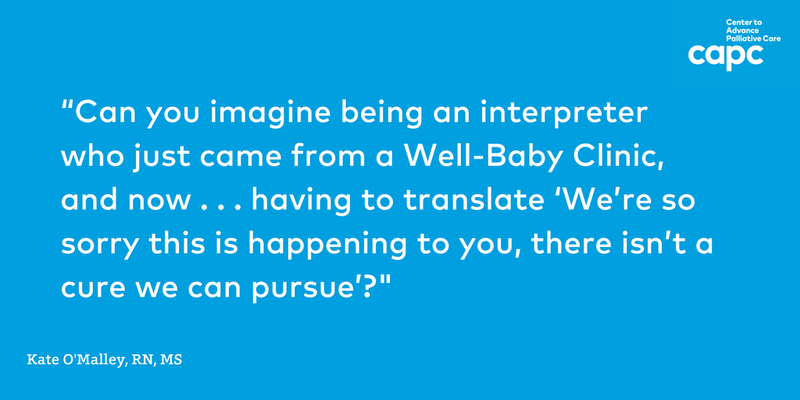 These conversations are difficult enough for English-speaking clinicians who have extensive communication training – can you imagine being an interpreter who just came from a Well-Baby Clinic, and now has to come to the bedside and explain to a person about their diagnosis of serious illness and their options for care? How about having to translate “We’re sorry this is happening to you, and there isn’t a cure we can pursue”? Just think of the complexity and emotional overtones of these conversations, particularly in safety net hospitals when many of these diagnoses are made late because the patients had no source of care. Young men in their 20s with headaches for six months who come in to find out they have an advanced brain tumor, women with children at home who have breast cancer and were never diagnosed – extremely difficult situations. And interpreters were never really trained on how to interpret in the context of palliative care. So we partnered with palliative care experts at San Francisco General Hospital and an interpreter education expert to create a training curriculum for palliative care interpreters in the field. My favorite part of this curriculum was developing and filming three vignettes for a monolingual Spanish-speaking patient: 1) breaking bad news, 2) conducting a family conference, and 3) providing spiritual support. My project manager, Monique Parrish, and I were active players in the entire endeavor – drafting the scripts, hiring the actors, bringing in a film crew, supporting filming at a clinic on weekends, and editing the final product. These videos continue to live on CHCF’s website, and we also worked with the Health Care Interpreter Network (HCIN) to convert the workshop curriculum into a web-based course for which interpreters can earn continuing education credits. The whole project was hands-on, exciting work that met a unique need in California. Being Mortal Community Screenings. My second favorite project was doing community screenings of “Being Mortal”, the PBS documentary based on Dr. Atul Gawande’s book. While we were very excited when this film originally aired in February 2015, we were also conscious about the typical audience for PBS documentaries and the need to share this moving work with a much broader community. We partnered with the Sacramento-based John and Wauna Harman Foundation – which also funded the original film – to conduct outreach to diverse and underserved communities. Part of this work included providing grants to local communities and faith-based organizations to host community screenings of the film. We provided grantees with the original film, special supplemental clips from both Dr. Gawande and California’s Secretary of Health and Human Services Diana Dooley, a discussion guide, and outreach materials. Part of the screening events included post-film panel discussions that would allow the community to dialogue with local experts in the field. We followed up all these activities by conducting an evaluation to gauge whether the film had an impact on viewers’ attitudes about these issues; approximately 300 people responded to the email survey, sharing that they felt more comfortable with these discussions, and that many had gone ahead and spoken with someone about their wishes. Based on the success of the two foundation partnership, The Harman Foundation continues to promote national events to screen the film and is partnering with the Hospice Foundation of America. The national effort requires that the screenings be co-sponsored by a local medical society or health organization. I attended one screening in Berkeley, CA, that was co-sponsored by Ashby Village and the Center for Independent Living, a successful collaboration bringing elders and the disabled community together on an issue of mutual interest. There were also smaller, offshoot projects. CHCF gave a grant to Stanford University, which dubbed “Being Mortal” in Spanish and loaned it to other community groups; another project developed Vietnamese subtitles so that the film could be shown in that community. There were just so many fantastic activities that happened at the community level that we never could have predicted. I would also say that the process of doing this work in California is a work-life “favorite” – California has a wealth of passionate palliative care leaders in all disciplines and the foundation’s work was built on the collective talent of treasured colleagues. CAPC: What CHCF project are you most excited about for the future? KOM: We are very deep into our electronic POLST pilots to see whether California can establish technology that will accept POLST forms submitted by providers in a variety of ways and ensure that the forms are matched to the correct patient, stored securely, and easily retrievable by any provider caring for the patient – specifically first responders and emergency room/ICU staff. It sounds simple, but the devil is in the details – as always! Most recently, CHCF awarded rural palliative care planning grants to seven rural-focused stakeholder teams. Each is charged with developing a vision and plan for increasing rural palliative care access. We brought all the grantees out in January to attend a meeting, and the planning period ends April 2017. I hope work in rural California will continue after the planning grants are concluded. CAPC: From your vantage point, what are the biggest threats to palliative care in the coming years? The greatest opportunities? KOM: I wouldn’t call this a threat, per se, but it is increasingly challenging to navigate the proliferation of specialty programs designed to care for individuals in the top five percent of the health care utilization pyramid. There seems to be this move to parse out the subsegments of the population – substance abuse, behavioral health, palliative care, end of life “organ” care, etc. – with interventions that only serve to splinter the system. A part of me just wants to stick all of the programs into a blender and blend them all together, because we KNOW there are some unifying principles: the focus on care for people with serious illness; the benefit of the interdisciplinary team; the need to understand the individual’s goals and what they want in terms of intensity of care; and the need to provide care in a culturally competent manner. It is hard to see how palliative care as a specialty can grow when it’s competing in this burgeoning specialty care market and there are such workforce limitations. The more that we can train all clinicians to incorporate the core components of palliative care into what it is they are already doing, the better it will be for seriously ill patients. That being said, I think the increased awareness of (and commitment to) the needs of seriously ill patients in recent years is a real opportunity. We have seen a lot of unexpected allies come out of the woodwork due to the frequent stories in The New York Times and other publications, and important writings that people have actually seen and read. 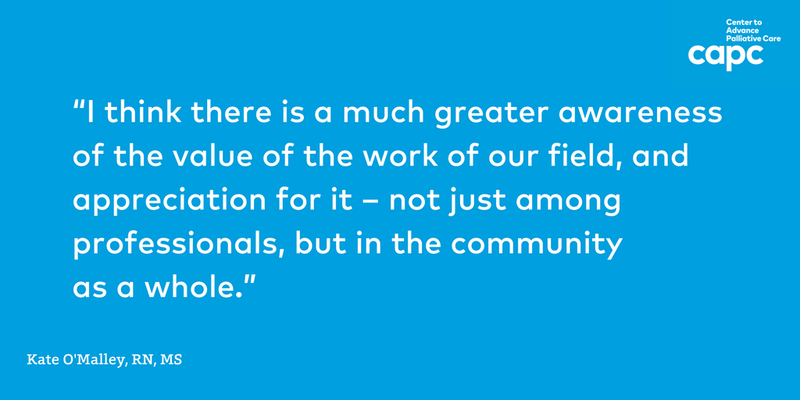 I think there is a much greater awareness of the value of the work of our field, and appreciation for it – not just among professionals, but in the community as a whole. And despite the fact that everyone’s attention has been a bit . . . divided as of late, the broad priorities in California have not changed. In January, the Governor delayed the implementation of the landmark SB 1004 legislation (which directs Medi-Cal managed care plans to provide palliative care to their beneficiaries with serious illness) because there wasn’t yet sufficient staffing at the state level to manage the rollout of the benefit to millions of people. Yet, when we sent out an invitation to the 20+ Medi-Cal Managed Care plans for a palliative care meeting, most attended. The interest in providing better care to people with serious illness is real, and the health plans are working towards implementation, even though the legislation has been delayed. In addition to the public awareness, I think this commitment to palliative care has built over time with CHCF’s original payer-provider work and ongoing collaboration with multiple champions and stakeholders through the California Advanced Illness Collaborative (CAIC). The CAIC has several projects in the works, including developing a model contract for health plans to use. We are still working on the final product, but one possible direction for the latter project could be piloting this contract with all the payers in a single geographic region, with the vision of ensuring that there’s full access to palliative care that is not just driven by a health system or a payer. Finally, I think there’s tremendous opportunity with technology and telemedicine in palliative care – I’m really curious and excited to see where this leads. Given what we know about gaps in access, having tools that could allow people to receive the care they need without relying so heavily on face-to-face/home visits would make a huge impact. CAPC: What steps would you suggest for palliative care champions who are trying to increase access at the state level? KOM: Any champion or group needs to first answer the question, “What do we actually have in terms pf palliative care capacity, and what is the problem we are trying to solve for?” Doing an inventory of what palliative care services your state has (particularly community-based) is critical to answering this question. One cool project that we started in 2015 with Kathleen Kerr (Kerr Healthcare Analytics), Brian Cassel (Virginia Commonwealth University), and Mike Rabow (University of California, San Francisco) was focused on identifying palliative care supply. The data this produced was very revealing; for instance, we realized that there are several heavily populated rural counties that have no access to palliative care. As a result, we decided to launch the rural access initiative with a focus on areas in which we knew that we could make the most impact. So for other states interested in expanding access to palliative care, I think the mapping project is a good place to start. Our methodology is publicly available, and it was not a terribly expensive project – even for a state the size of California. Building partnerships is also critical. I mentioned our payer-provider partnership work previously, which is critical because developing rational payment models and contracts will help ensure the sustainability of the field. Beyond that, one of my biggest takeaways from the project is that people need help getting out of their own orbit. They have their own needs and don’t necessarily understand one another’s challenges. When there’s an incentive and a process to get people out of their orbits, identify shared goals, develop trust, and co-create the solution, then the result can be really positive. Furthermore, having a broad-based stakeholder team that brings in not just providers and payers, but also the community is essential to growth. We are fortunate in California to have many palliative care leaders, but it’s through our partnerships with other organizations that we are able to make the most of these valuable resources. And as you heard in some of my favorite projects, it was really effective and rewarding when we could bring our work to diverse communities. To learn more about the California Health Care Foundation and its palliative care work, please visit http://www.chcf.org/topics/end-of-life-and-palliative.